Republican Sen. Thom Tillis of North Carolina said Wednesday he's "fine" after collapsing during a Washington, D.C., race and being taken away by ambulance. Tillis posted a video on Twitter from his hospital bed hours after the early morning race. "Hey everybody, I'm fine. Just running about 2 and a half miles in and got overheated, no CPR, no special measures, just checking me out. See you back on the Hill," the first-term senator said. By Wednesday afternoon, Tillis had returned to work and was chatting with staff on the Senate floor. Tillis, 56, was seen on the ground at about 15-20 minutes into the race, which started at 8 a.m. Bystanders were observed working on the senator in what appeared to be cardiac pulmonary resuscitation, but Tillis said there was no CPR administered. Tillis at first appeared unconscious but was revived and breathing when taken away by ambulance. 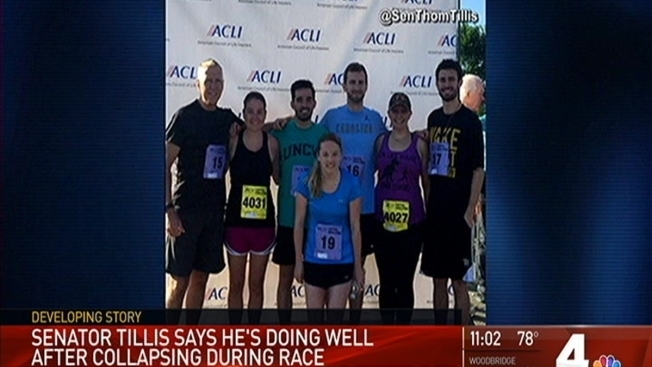 Tillis was participating in the ACLI Capital Challenge race, an annual event in Anacostia Park in the district. He was leading his own team, "Team Tillis." Many politicians and other prominent Washington, D.C., figures run the annual race. Proceeds go to charity. When not in Washington, Tillis lives north of Charlotte and is a former speaker of the North Carolina House of Representatives. He was elected to the Senate in 2014. Tillis is known for his athleticism as an avid mountain biker and participant in obstacle endurance races. He is married to Susan Tillis and has two children. Wishing my colleague @SenThomTillis a speedy recovery. Prayers for my friend @SenThomTillis. Wishing him well. Praying for Sen Tom Tillis. Hope you will too. An earlier headline on this story misspelled the senator's name.